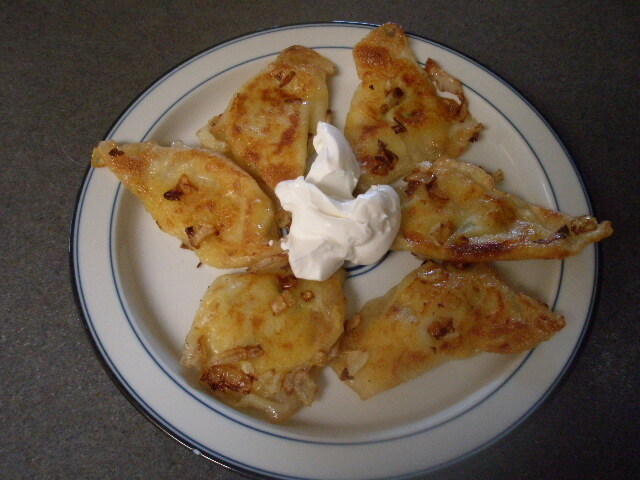 Pirohi is a comfort food familiar to Eastern Europeans. No matter the spelling, those scrumptious puffs filled with potato, sauerkraut, prune, farmer’s cheese, or other combinations were devoured with pleasure. Pirohi stir nostalgia for home cooking and bring back memories of childhood. Prep – Place a small amount of potato mixture in the center of a wrapper. Wet the wrapper edges with water and seal tightly. Bring a pot of water to a gentle boil. Add a few drops of oil. Drop in a few pirohi at a time. Don’t overcrowd. Stir occasionally, making sure none stick to the bottom. When a pirohi floats to the top, it is done. Final touches – Saute thawed pirohi with oil and a little butter. Dice onion and add as the pirohi brown and crisp. To serve top with sour cream. Apple sauce is also a favorite.